Was Dr. Martin Luther King, Jr. a Christian? NO! Tracing the evolution of his religious beliefs in a sketch written at Crozer entitled "An Autobiography of Religious Development," King recalled that an initial sense of religious estrangement had unexpectedly and abruptly become apparent at a Sunday morning revival meeting he attended at about the age of seven. A guest evangelist from Virginia had come to talk about salvation and to seek recruits for the church. Having grown up in the church, King had never given much thought to joining it formally, but the emotion of the revival and the decision of his sister to step forward prompted an impulsive decision to accept conversion. He reflected, "I had never given this matter a thought, and even at the time of [my] baptism I was unaware of what was taking place." King admitted that he "joined the church not out of any dynamic conviction, but out of a childhood desire to keep up with my sister." Martin Luther King may have had a religious experience, but he didn't find Jesus. King admits that he was "unaware" of what was taking place. Going to church to keep up with his big sister is nice, but it is NOT salvation. King had Churchianity without Christianity, religion without Truth. In the same sketch, "An Autobiography of Religious Development," King wrote that, although he accepted the teachings of his Sunday school teachers until he was about twelve . . .
...this uncritical attitude could not last long, for it was contrary to the very nature of my being. I had always been the questioning and precocious type. At the age of 13 I shocked my Sunday School class by denying the bodily resurrection of Jesus. From the age of thirteen on doubts began to spring forth unrelentingly. 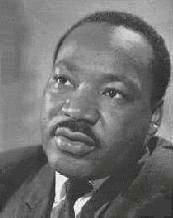 While it is widely believed that Martin Luther King, Jr. was committed to the “Christian religion,” he was far from it. He denied some of the most fundamental components of historic Christianity. He repudiated the doctrine of the deity of Jesus, and he rejected the concept that the Lord was raised bodily from the dead. King disdained the New Testament affirmation of Christ’s virgin birth, asserting that the early Christians devised a mythological story to account for the moral uniqueness of Jesus of Nazareth. His theology has been profusely documented in The Christian News Encyclopedia. 1. In his paper "What Experiences of Christians Living in the Early Christian Century Led to the Christian Doctrines of the Divine Sonship of Jesus, the Virgin Birth, and the Bodily Resurrection," MLK thought that in order to understand the true meaning of orthodox creedal doctrines—like the divine Sonship of Jesus, the virgin birth, and the bodily resurrection—the literal element needed to be stripped away in order to uncover the true experiential foundation beneath it. MLK believed that the “virgin birth” was unscientific and untenable; like divine Sonship, this doctrine developed as a way for the early church to indicate how highly they valued the uniqueness of Jesus. MLK believed that the doctrine of the resurrection of Jesus was an attempt by the pre-scientific early church to symbolize the experience that they had with Jesus. 2. Read in light of the above, it is clear to me that in the paper, "The Sources of Fundamentalism and Liberalism Considered Historically and Psychologically," MLK is self-consciously identifying himself with classical theological liberalism and rejecting the doctrines of fundamentalism. MLK praised theological liberalism. In addition to the denial of the doctrines of divine Sonship, the virgin birth, and the resurrection, MLK points out that there is also a denial of Scriptural inerrancy and the doctrine of the fall. MLK scorned theological fundamentalism. MLK seems not to believe in the direct creation of the world by God, man as being in the image of God, the historical account of Adam and Eve, the person of the Devil, the Fall, hell, the Trinity, the substitutionary atonement, and the Second Coming. 3. In his paper, “A Study of Mithraism,” MLK suggests that the doctrines of the early church grew out of the Greek mystery religions and cults which flourished at that time. 4. In an interview with Time Magazine, MLK seems to indicate that it was at Crozer Theological Seminary (the setting for the term papers quoted above) that he saw that the ministry was a framework by which he could express his philosophy of social protest. Martin Luther King was a heretic, NOT a Baptist preacher. The Baptist faith has certain distinguishing distinctives, you can't just call yourself a "Baptist" and become one. Doctrinally, King was a false prophet. The following information clearly reveals that Martin Luther King Jr. was NO Baptist and certainly NO Christian. "How I long now for that religious experience which Dr. Brightman so cogently speaks of throughout his book. It seems to be an experience, the lack of which life becomes dull and meaningless. As I reflect on the matter, however, I do remember moments that I have been awe awakened; there have been times that I have been carried out of myself by something greater than myself and to that something I gave myself. Has this great something been God? Maybe after all I have been religious for a number of years, and am now only becoming aware of it." Brightman's explanation of religious experience convinced King that he could experience God's powerful presence in his own life without the benefit of a sudden religious conversion. What a bunch of heresy!!! Martin Luther King Jr. was NO Christian. How can someone call them self a "Christian" and be confused on the definition of God? The Bible clearly defines Who God Is. Jesus Christ is God! (John 1:1-3,14; Revelation 1:8). King believed that God could be found through "religious experience." John 14:6 declares that the ONLY way to God the Father is through Jesus Christ, NOT religious experience! Listen friend, the Word of God proclaims "Ye must be born again (John 3:3). It's as simple as that. All the religious experiences in the world never saved anybody. In fact, religion is the worst thing that ever happened to this sin-cursed world. So which religion is the right one? That's an easy answer... NONE of them! Salvation is NOT found in any religion, but in a Person—The Lord Jesus Christ. Martin Luther King Jr. spoke much about "religious experiences," but rarely a word is ever mentioned about the Saviour Jesus Christ. The Bible proclaims a simple Gospel of salvation ONLY made possible by the blood of Jesus Christ. Thus, eternal life is a free gift from God to those who will simply believe upon the name of Jesus Christ (Romans 10:13). I did not publish this article to be unkind, but to expose Martin Luther King Jr. for the unsaved heathen man he was. Sadly, Mr. King is burning in Hell today because he died in his sins without Christ. The Word of God plainly teaches that the ONLY way to Heaven is through faith in Christ alone (John 14:6; Acts 4:12). No Christian would ever deny the virgin birth and the deity of Christ as King did. Also, I am NOT a racist. God loves all people, regardless of who they are. We are to do the same. God never condones sin, but He certainly loves the sinner. God is not willing for any to perish, but for all to repent of their unbelief and come to Christ (2nd Peter 3:9). King found religion, but his teachings reveal that he never found Christ as his personal Saviour. I also want to condemn the KKK for the Satanic group that they are. It is wicked to hate anybody. God does NOT hate people, He hates sin and wickedness. I do NOT endorse any group that hates people. I love African American people, but they (and the rest of America) have been misled concerning Martin Luther King Jr. He may have been a very influential person, but King's influence was NOT for God. He led people into a social Gospel that united people by error, not truth. Ecumenism is willing to unite by error, but the Word of God separates people over the Truth. While the Devil's crowd says, "We must unite at any cost;" the Word of God commands us to separate from the wicked (2nd Corinthians 6:14-17). It's infinitely better to be divided over truth, than to be united by error. Uniting by error brings compromise, indifference, and apostasy. Coretta Scott King: NO HERO!